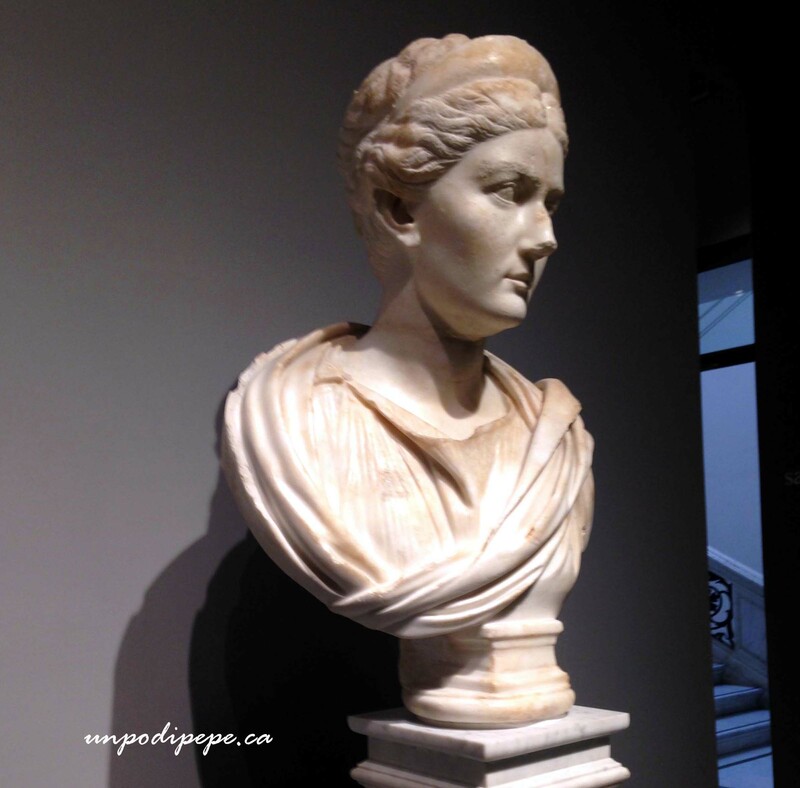 On a recent visit to Palazzo Massimo alle Terme, I walked the corridors lined with ancient Roman busts and was struck by the variety and realism of sculpted hairstyles. Many of them are so detailed, the hair looks like it is moving. 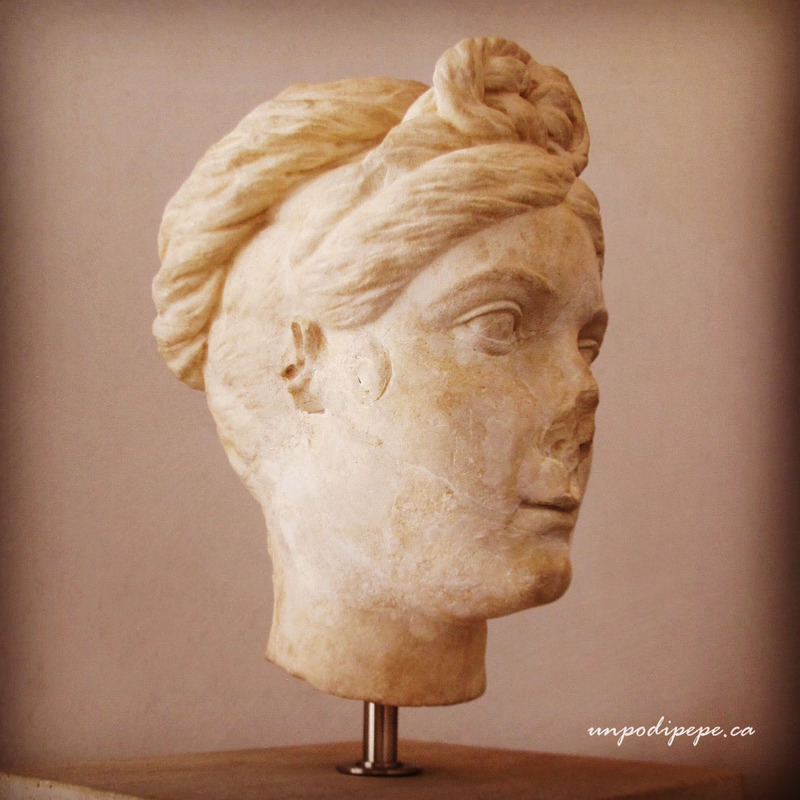 Roman women originally wore their hair in simple styles with a circular band around the head, a bun at the nape of the neck or on top of the head. 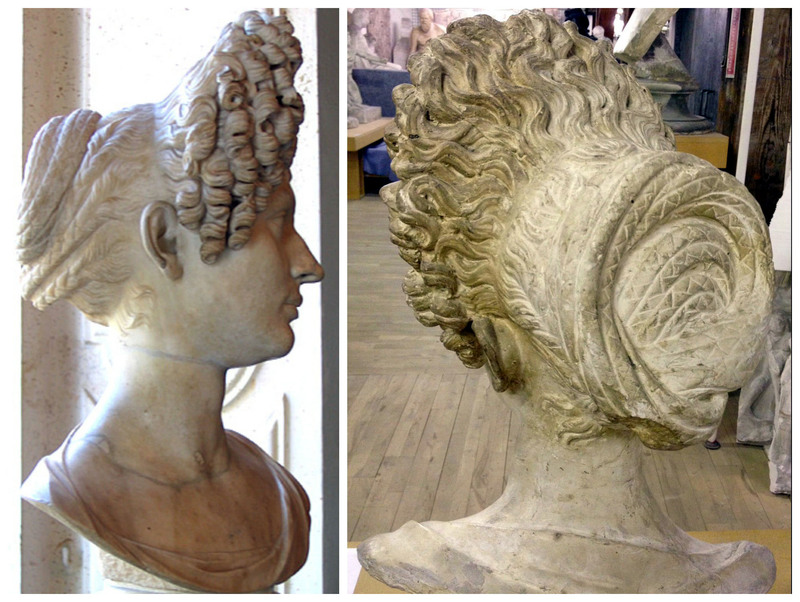 In Imperial Roma (1st -3rd C AD), hairstyles were always changing. 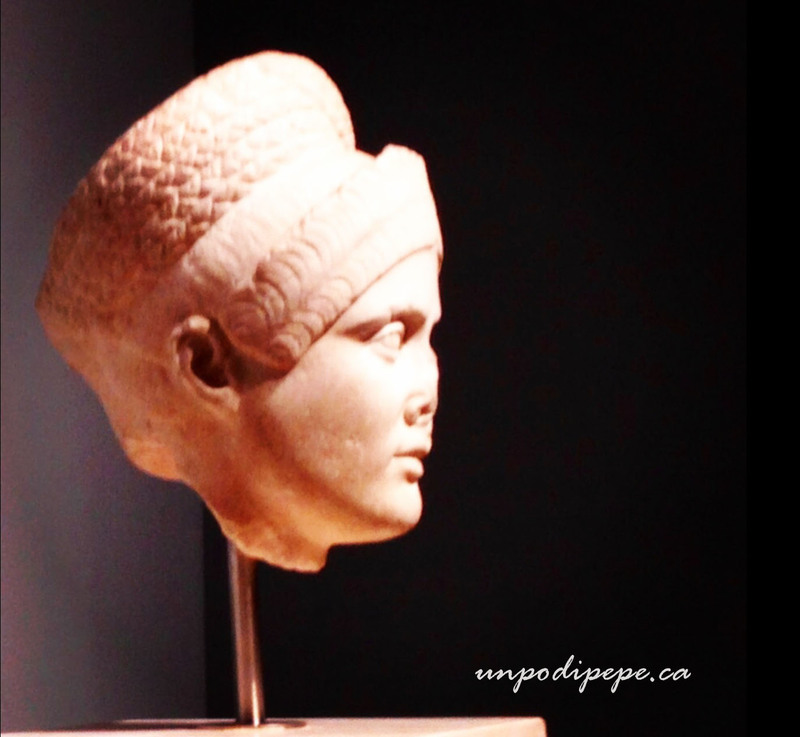 Archeologists are actually able to identify and date coins and busts based on the hairstyle, which was often worn by the empress of the time. 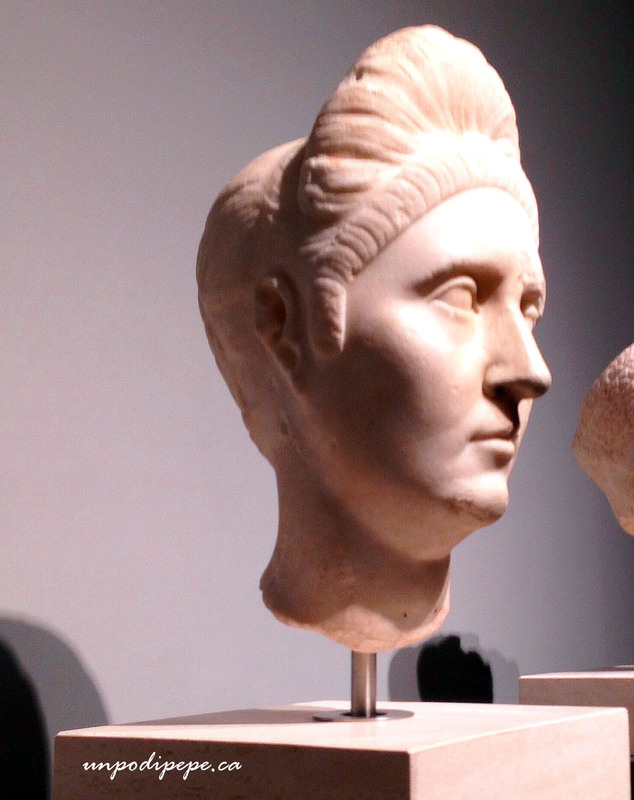 During the reign of Emperor Augustus elaborate updos for married women became fashionable, and really got big and complex in the Flavian and Trajanic eras. Clothing styles for women were simple, and unlike men, whose status could be reflected in their clothes, there was no special dress code to distinguish status. Women could only display their status, wealth and age via their hairstyles and jewellery. A natural hairstyle was considered barbarian, and implied a lack of both wealth and taste. 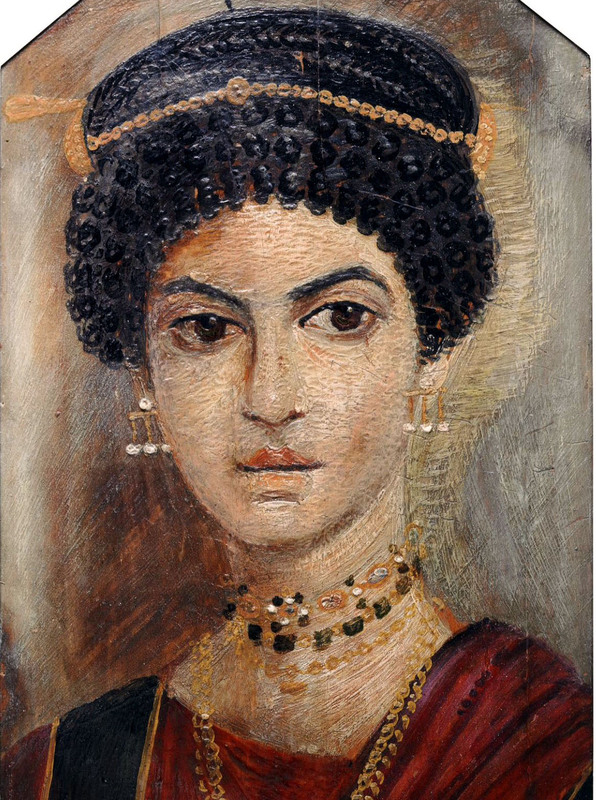 For Roman noblewomen, complex, unnatural hairstyles requiring hours of daily attention showed wealth and culture to the max. It was the job of slave hairdressers called ornatrice and their assistants to put hair up and take it down. 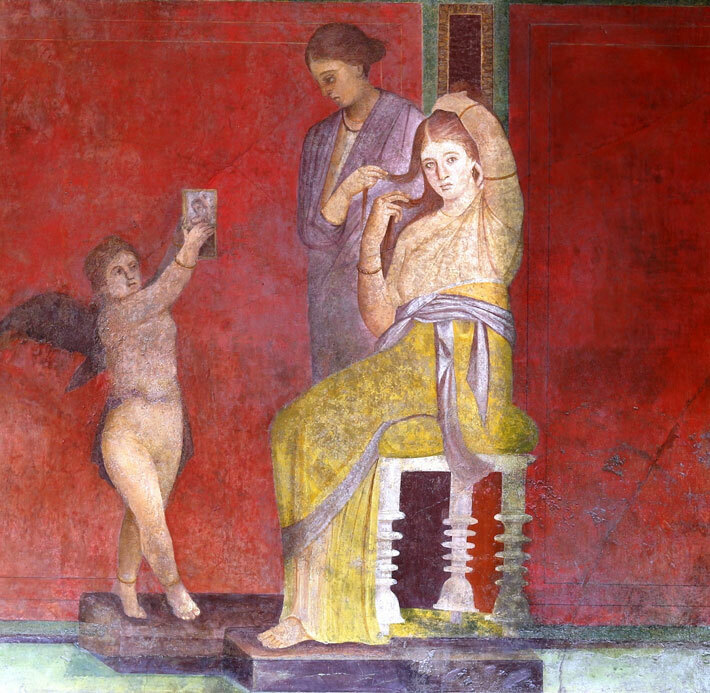 Scenes of hairdressing and mirror-gazing were popular subjects in portraiture and reliefs, such as the 50 BC fresco from the Villa of the Mysteries in Pompeii. 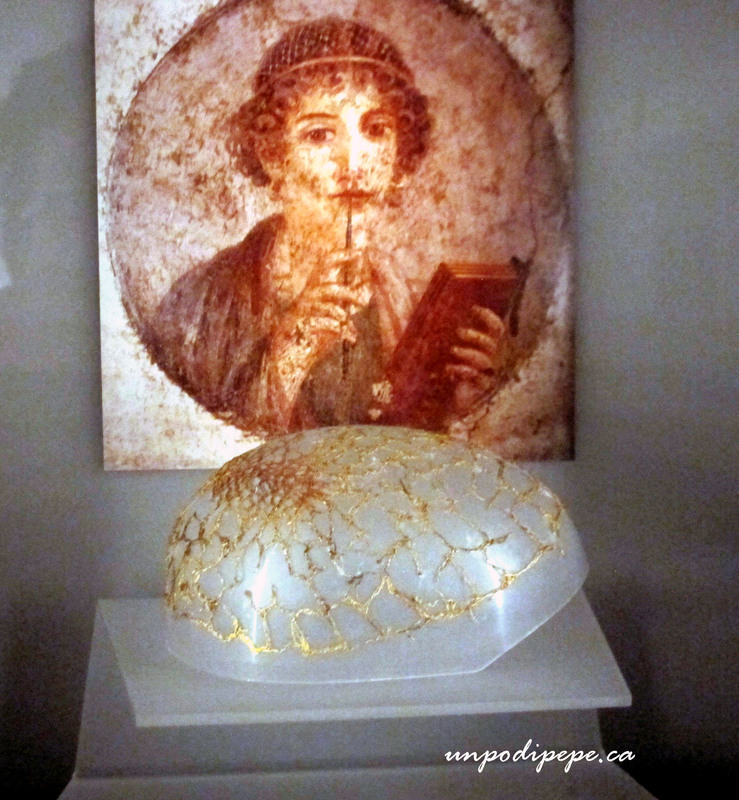 Reticula (hairnet) of finely woven gold, found on Via Tiburtina, Palazzo Massimo. In behind is the poet Sappho wearing a hairnet, from a Pompeiian fresco. Ornatrice curled hair in ringlets by wrapping it around a tapered bronze rod called a Calamistrum, which was heated in hot ashes or open flame. Hair was twisted, braided, curled, teased, wrapped and tied with cords or ribbons to bind around the head. Carefully arranged styles, braids and buns were stitched up with blunt bone needle and wool thread, held with wire, painted bone, ivory or jeweled hairpins and combs, and hairnets called reticulae of finely woven gold wire. Beeswax pomade was the only styling product available-the closest thing to hairspray they had! My similated ‘Ornatrice Toolbox’ containing blunt needle and wool thread. hair piece and hair bodkin, leaf spring scissors, camel bone comb, beeswax and a ‘calamistrum’ which is actually my ring mandrel, but it is the right shape! 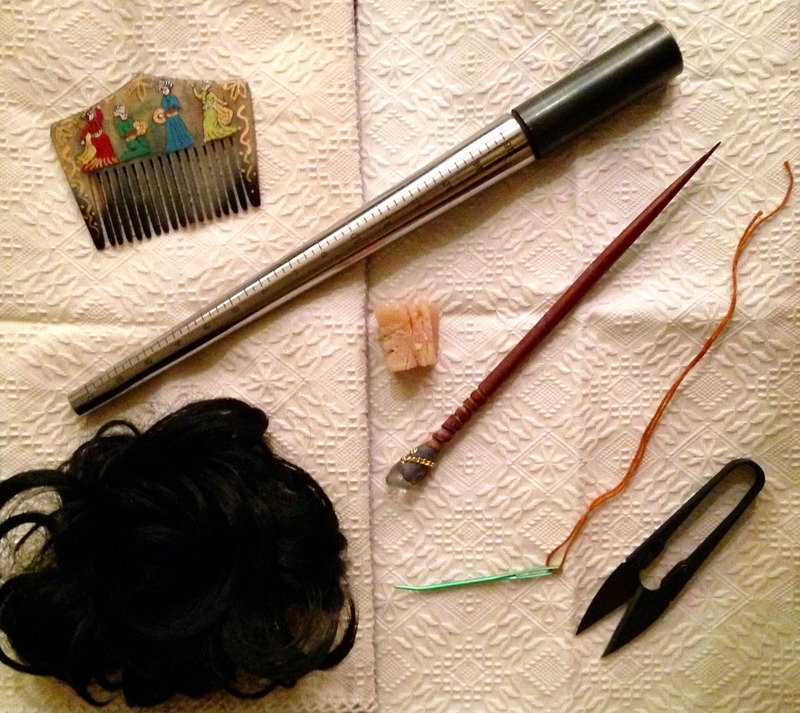 Romans dyed their hair with everything from herbs to yucky potions. Hair was lightened with lemons, chamomile, henna, saffron, turmeric, baking soda, ammonia, and even pigeon poop. Hair was reddened with henna from Egypt or animal fat mixed with wood ashes. According to Pliny the Elder, hair could be dyed black by applying leeches that had been rotting in red wine and vinegar for 40 days. Yuck! Hair was also darkened with lead oxide, copper filings, or burned walnut shells and leeks. A paste of herbs and crushed earthworms was applied at night to prevent gray. Che schifo! Women kept their hair as long as it grew, so styles were done with very long hair. Over time, all of this pulling, pinning, colouring, and frequent curling at high temperature led to hair thinning and damage. The only ‘hair products’ available were olive oil, honey and eggs. As they got older, women often had to use hairpieces, extensions and wool pads to make their hair look thicker or longer. These were braided into existing hair, pinned, or sewn in with wool thread, twine or wire and a blunt bone needle. In extreme cases, a capellamentum or full wig could be worn. 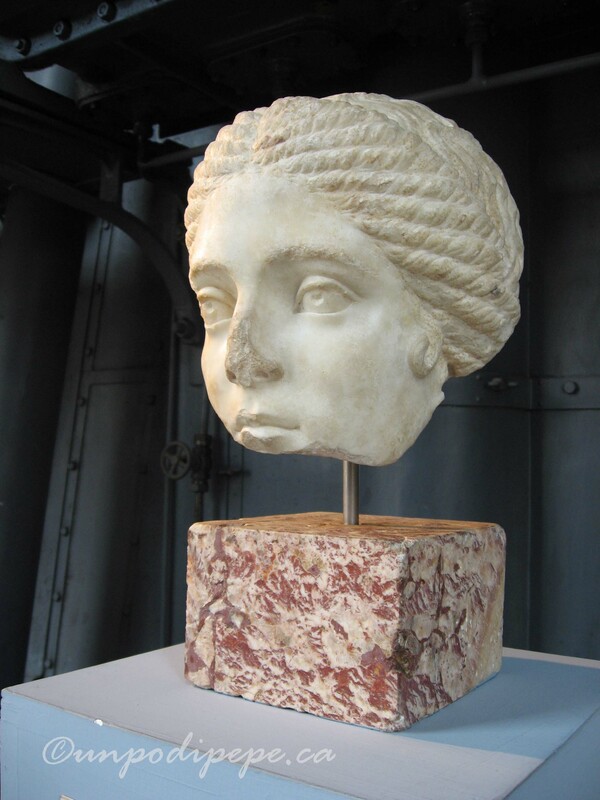 Busts were sometimes even made with detachable marble hairpieces so the style could be updated without the expense of commissioning a new bust. 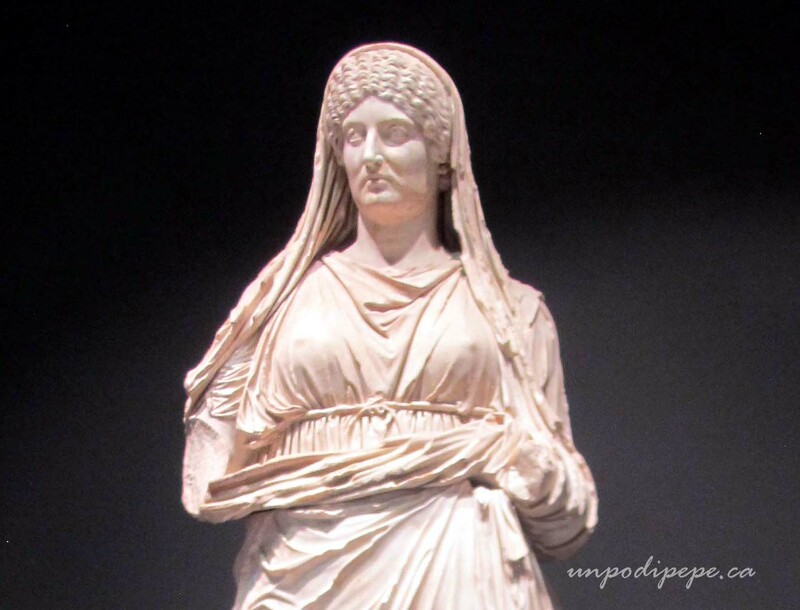 Most adult Roman women wore a palla when they left the house. This was a long cloth wrapped around the body and draped over the back of the head as a veil. A woman wearing her hair uncovered and loose in the street could be mistaken for a prostitute! 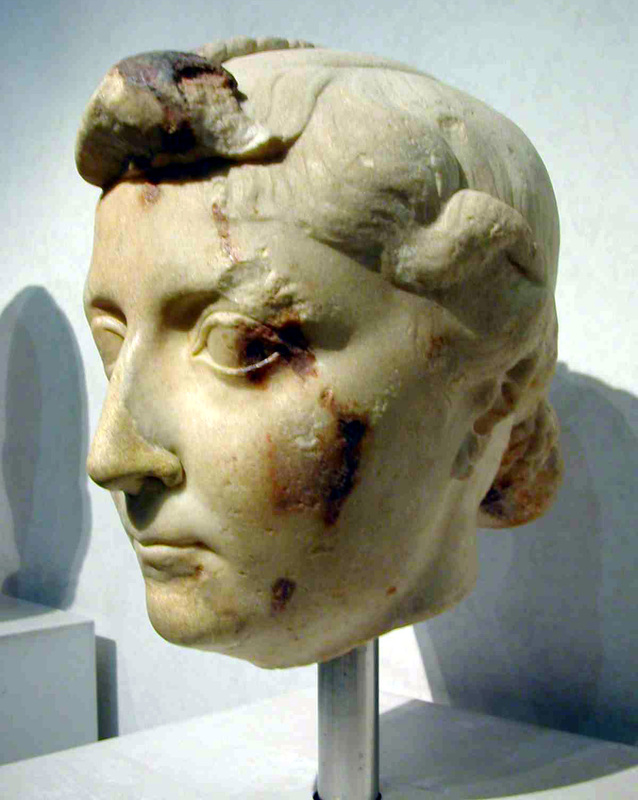 The ancient Nodus hairstyle was worn by Livia Drusilla, wife of Augustus and also his sister Octavia. The hair was parted in 3 sections. The side hair was tied into a bun at the back and the middle section looped back on itself like a pompadour and then braided to join the bun. 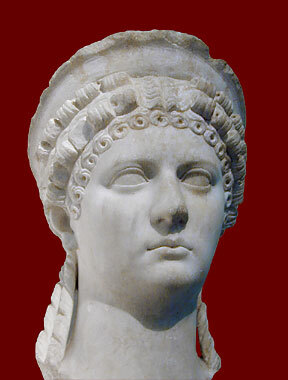 Plotina Pompeia, wife of Trajan, Palazzo Massimo. Her nodus is a high cascading ponytail. Roman women even tied their hair in knots. Above is a Hercules Knot, also called a reef knot or square knot. Left over right, right over left! Roman brides often wore a belt with a Hercules knot, which is where the phrase ‘to tie the knot’ comes from, but the hairstyle was not associated with marriage. Vibia Sabina also wore this style. 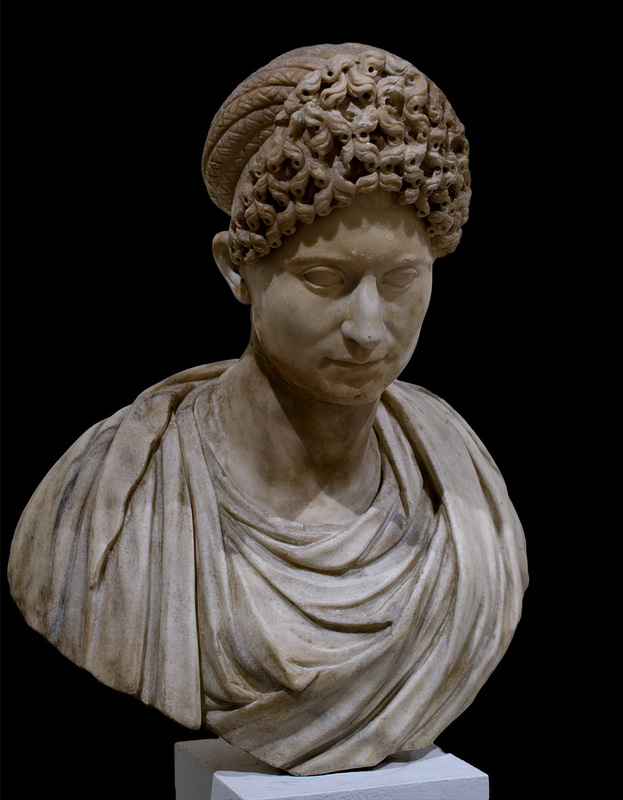 This partial bust of Agrippina Minor (15-59 AD), mother of Nero, found in Ostia has tightly curled short front hair with a diadem (tiara). We have to imagine the rest of the hairstyle, with a bun and ringlets in the back, coming over her shoulders. Poppea Sabina (31-65 AD) the wife of Nero had a talented, hardworking ornatrice! 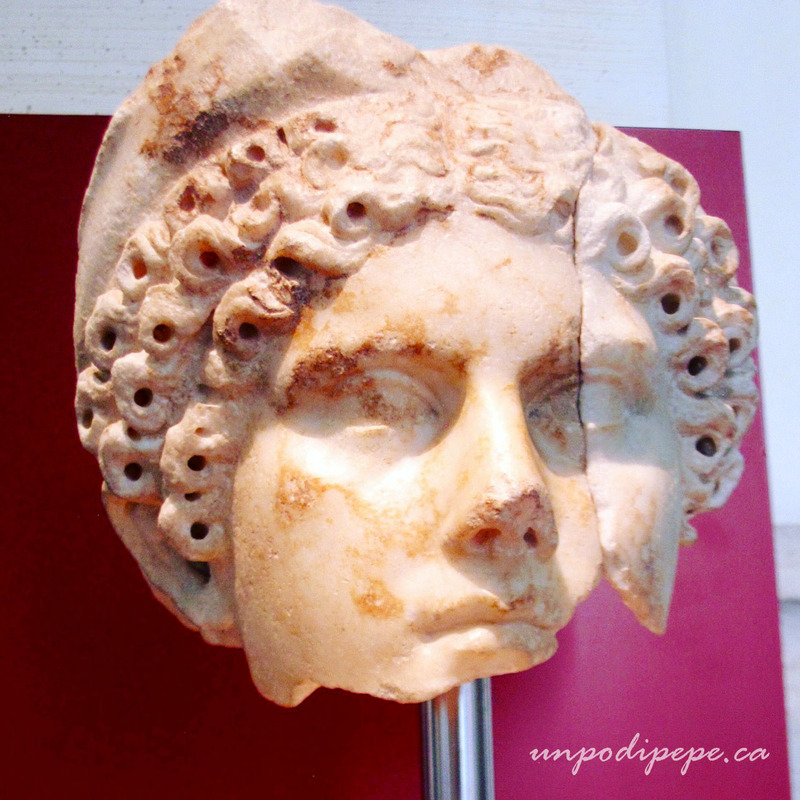 Her bust features two rows of interesting looped tight curls under the diadem and ringlets down the back. Look at those fine little curlicues around her face. They were probably held in place with beeswax pomade. 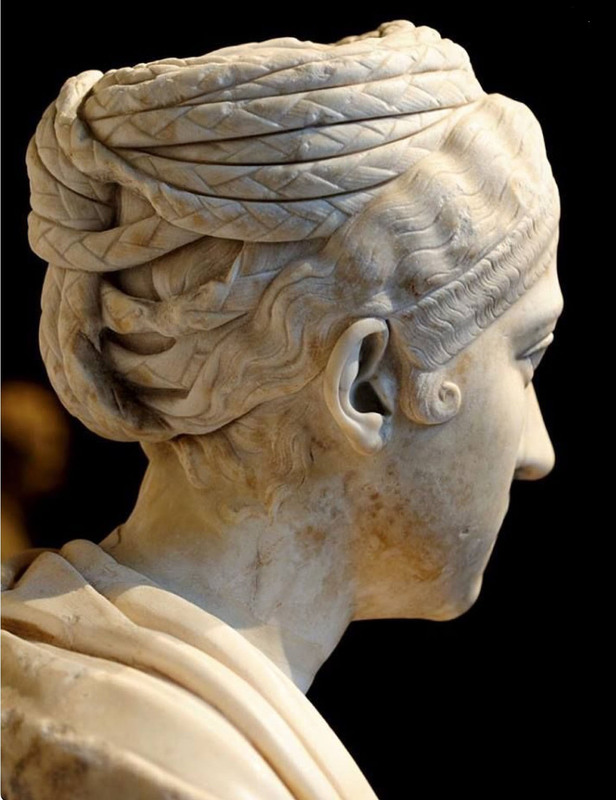 The Hadrianic Turban or tower hairstyle was like a turban of parallel braids that were sewn together on top of the head. 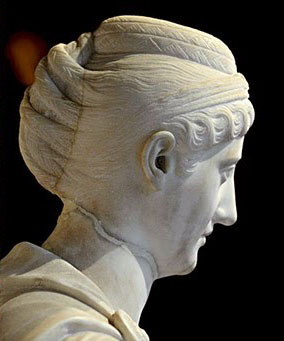 This style was often worn by Vibia Sabina (88-137 AD) wife of Emperor Hadrian and can also be seen on the Egyptian Mummy portrait at the end of this post. This back view of one of Vibia Sabina’s hairstyles is an absolute masterpiece- un capolavoro. This sculptor wins the best stone hairdressing prize. You can feel the weight of that massive coil of knotted braids on her head. The details are amazing, like the tendrils on the back of the neck, and that little curl beside the ear. The hairstyle of Faustina Maggiore (the Elder) is another work of art. It is like a French roll made with braids, then rolled into a coiled bun at the top of her head like a Jackie-O pillbox hat. During the Flavian and Trajanic eras (late 1st, early 2nd C AD) the ‘orbis comarum’ or circle of hair with really big, tall front hair was in fashion. A shorter fringe of tall tight curls or ringlets was piled high in the front, and braids wound into a big wreath bun in back. The big front hair was often curled, teased, and then sewn in place and supported by wires and padded with a wool pad or hairpiece. The Fonseca Bust in the Musei Capitolini is a portrait of an unknown Flavian woman with the Orbis Comarum. The front ringlets are sculpted using a hand drill. Can you imagine making a mistake drilling one of those fine deep holes! The back view of the bust looks like a straw hat on the head. That big front hair looks mega-teased. It is amazing this was possible without hairspray! The side view is my favourite. I love how you can see the origin of all the braids. 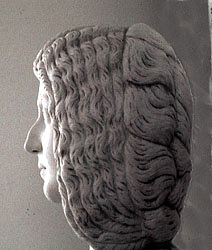 Flavian Woman, Museo Nazionale Venezia. Photo Wikimedia Commons. 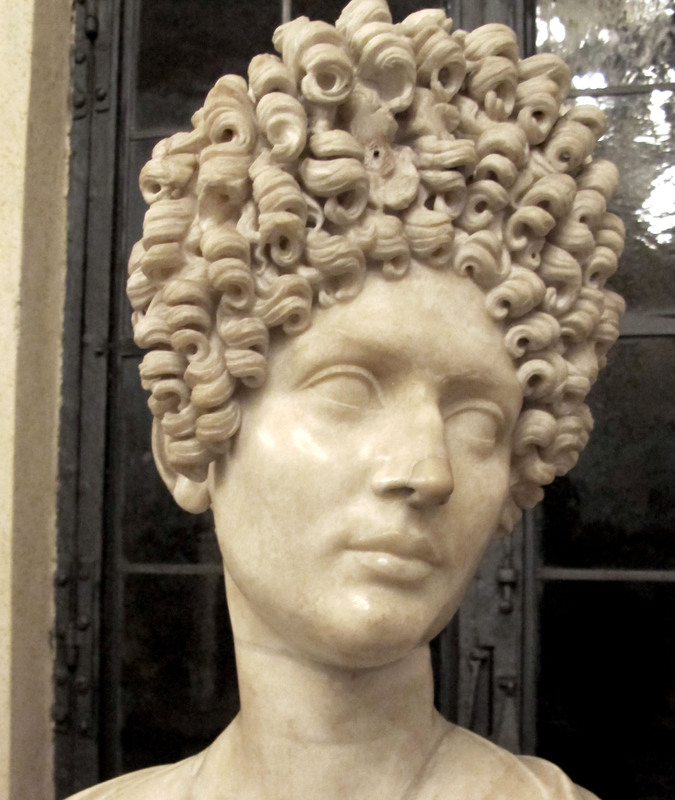 On this bust of an unknown Flavian era woman (75-100 AD), the small tight ringlets are sculpted with a hand drill. They almost look like fusilli! The big front hair looks like it is being propped up by the ropes of braids, wound high on her head. 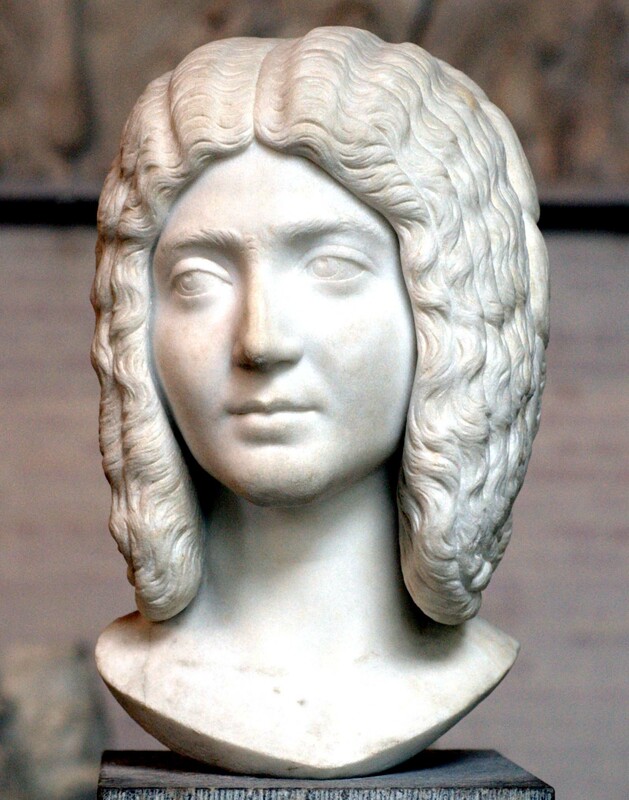 Giulia Domna (170-218 AD) the Syrian wife of Emperor Septimus Severus had a very distinctive hairstyle-and a nose similar to Lorenzo di Medici. Great sculpted eyebrows too! Her hair was twisted loosely in strands and draped around her face, then brought up the back of her head and sewn into a long, flat bun, which you can see in the side view. I guess she didn’t have to move around much! This lovely late 2nd C, early 3rd C AD partial Roman woman’s head was discovered in 1933, while Mussolini was constructing Via dei Fori Imperiali. Her front hair is twisted in small strands almost like Rastafarian corn rows to frame the face, and the back is twisted in a large, loose bun. She now sits in Centrale Montemartini in front of a caldaia -a giant boiler. Some of those are really ‘out there’! Gorgeous, and crazy all at once! I love this slice of cultural history. I always fawn over the jewelry, but I never thought much about the hairstyles. Fascinating! That one was my favourite too! Can’t wait to see the project come to “life”… My dreams are coming true for 2017 – have booked tickets to Trieste! Looking forward to food, family, fun and festivities! Fabulous post! As a retired hairstylist, I was especially enthralled by the photos and detailed commentary. Thank you so much for this post. I will send the link along to my fellow hairstylists. Grezie e tanti auguri! Il lavoro fantastico! Thank you. 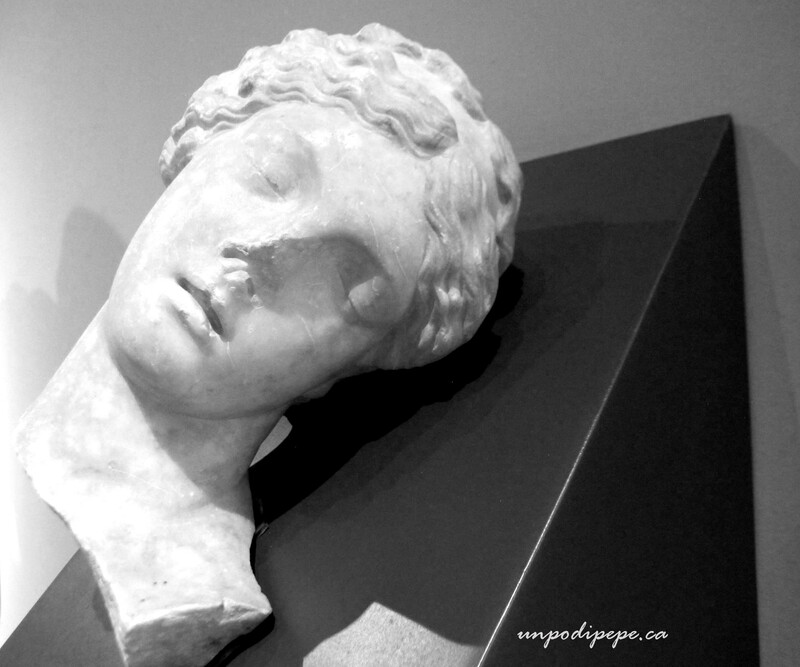 Palazzo Massimo delle Terme deserves to be much better known than it seems to be. What a fascinating place! Yes, I have—but it’s always worth a return trip.